Hinduism is the dominant religion of the community however there is a sizable chunk of Muslims also present in the community. The Hindus believe in God /Goddesses/Ghosts/Evil spirits and Moksha (salvation).They worship Lord Rama and Goddess Saraswati besides they also believe in some local Gods and Goddesses like Raja shank Pal and Nagni Devi. Agriculture is the main occupation of the community with rice and maize as the main crops. Besides agriculture wood cutting, Grazing Cattle and stone work (which includes extracting stones and using them for different purposes) are some other occupations for men. Women also take part in farming and cattle rearing. At present the documentation and description of the language is going on. It includes providing a brief grammatical sketch of the language and compilation of the pictorial dictionary of the language. The work to document the ethno linguistic profile of the community is undergoing with domains like stories, narratives, folklore, transportation, games and entertainment, religion and rituals, social customs and communicative behavior yet to be completed. 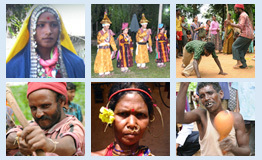 The documentation of various aspects of Siram language and community is being done in audio and video form.